The ASD TUG 2913 series tugboats are built by Damen Shipyards Group. Image courtesy of Damen Shipyards Group. SAAM SMIT Towage signed a contract with Damen Shipyards for a Damen Tug 2913 tugboat in October 2015. Image courtesy of Damen Shipyards Group. The ASD TUG 2913 tugboat has a maximum speed of 13.7kt. Image courtesy of Damen Shipyards Group. ASD TUG 2913 is a new series of highly manoeuvrable and powerful azimuth stern drive (ASD) tugboats offered by Damen Shipyards Group. The tugboats are ideal for busy harbours, streams with space limitations and open water missions. Damen has secured a contract from Fratelli Neri to deliver a new ASD 3212 tug. The series was launched in March 2013 and the first tug was delivered to Petersen & Alpers in February 2015. SAAM SMIT Towage contracted Damen Shipyards for a Damen Tug 2913 in October 2015. Delivery of the vessel, named SST Rambala, was made in May 2016. Italian towing firm Fratelli Neri placed an order for three ASD 2913 tugs in July 2016. The vessels were delivered in November 2016. The Meyer’s Group ordered two ASD 2913 tugs in March 2017. In April 2017, Damen secured an order from Saqr Ports, part of Rash Al Khaimah Ports, for an ASD 2913 tug. A keel-laying ceremony for the boat was held in August 2017 and delivery is scheduled for 2018. Rimorchiatori Riuniti, a company based in Italy, operates two ASD 2913 tugs named Danimarca and Germania. The series incorporates state-of-the-art hull, skeg, fender, fairlead and winch designs. Each vessel in the series features rigid foundations, extra-thick plates, fendering and additional brackets. The highly manoeuvrable vessel offers superior seakeeping and towing capability. It is the first Damen tug to feature a double hull, complying with the latest safety regulations. The modern wheelhouse incorporates ergonomically designed consoles, a helmsman’s seat on a sliding rail, large windows, a lined and insulated interior, centralised air-conditioning and GMDSS navigation equipment. The tugboat has an overall length of 29.10m, a breadth of 13.23m, a depth of 5.35m and a draught of 5.50m at aft. The full load displacement of the boat is 705t and the maximum bollard pull capacity is 80t. The forward deck is fitted with a heavy-duty rubber W-block fendering, a cylindrical fendering and a double-pole towing bitt. The heavy-duty, independent, double-drum and hydraulic anchor / towing winch can pull 38t at a rate of 12m/min. An obstacle-free aft deck features flush engine room hatches and a towing bitt. It can be fitted with a heavy-duty, single-drum, hydraulic towing winch and spooling device, as well as a SWL 100t towing hook, a crane and a capstan. The tugboat is fitted with dedicated tanks for holding 103.4m³ of fuel oil, 17.4m³ of fresh water, 5.3m³ of sewage, 5.2m³ of bilge water, 2.8m³ of dirty oil, 4.6m³ of lubrication oil, 2.4m³ of sludge and 70m³ of recovered oil. The ASD Tug 2913 series can be equipped with a range of navigation equipment, including a Furuno FAR 2117 radar system, NAVI, a Sailor 3000ECS-I sea-chart system, a Furuno DS-80 speedlog, a Magnetic Kotter compass, Simrad AP-70 autopilot, Furuno GP-150D GPS, and a Furuno FE-700 echosounder. Communications are supported by two Sailor 6222 VHF units, two Jotron Tron TR20 handheld VHF units, a Furuno NX-700 navtex, Furuno FA-150 AIS, Jotron Tron-40S emergency radio beacons and Jotron TRONSART20 search-and-rescue transponder (SART). Cabins on the tugboat accommodate up to ten personnel. The vessel also features a mess room with lockers, settees, alarm information and nautical communication, and a galley with modern equipment. All sanitary spaces aboard the boat provide hot and cold water. The boat is furnished with insulated spaces, air-conditioning, and durable and maintenance-friendly materials. The mess room and cabins are fitted with information displays, television, radio and computer systems. 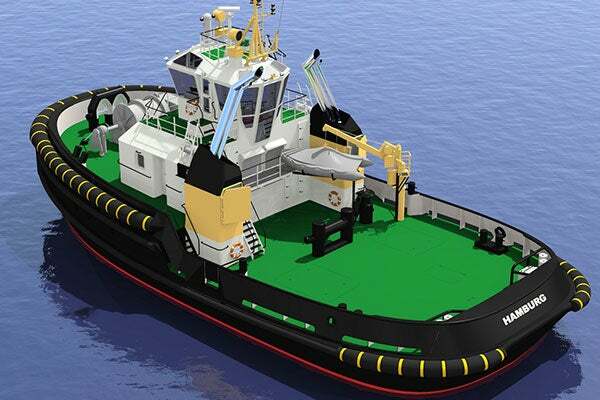 The tugboat is powered by two Caterpillar 3516C HD+ TA/D 16-cylinder V-type engines. These engines drive two Rolls Royce US255FP azimuth thrusters with CuNiAl five-blade, fixed-pitch propellers and a built-in slipping clutch. Each engine develops a maximum power of 2,525bkW at 1,800rpm. The engine room also integrates two 125kVA Caterpillar C6.6 TA generators, a fuel oil purifier and 35dB (A) exhaust silencers. The propulsion system provides a maximum speed of 13.7kt. As a leading manufacturer of type-approved (IEC 60945) displays and computers for the professional maritime market, Hatteland Display, a Norwegian-based manufacturer, has for 20 years led the way in supplying products to this specialised market regulated by IMO rules.